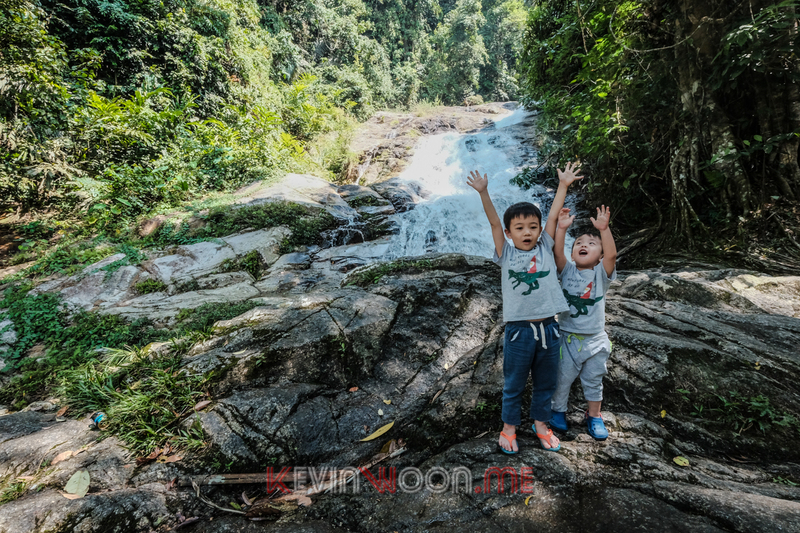 Lata Iskandar waterfall wasn’t part of our travel itinerary but I decided to stop by because 1) the boys haven’t seen a waterfall before and 2) I supposed the boys needed some fresh air after almost 3 hours in the car. 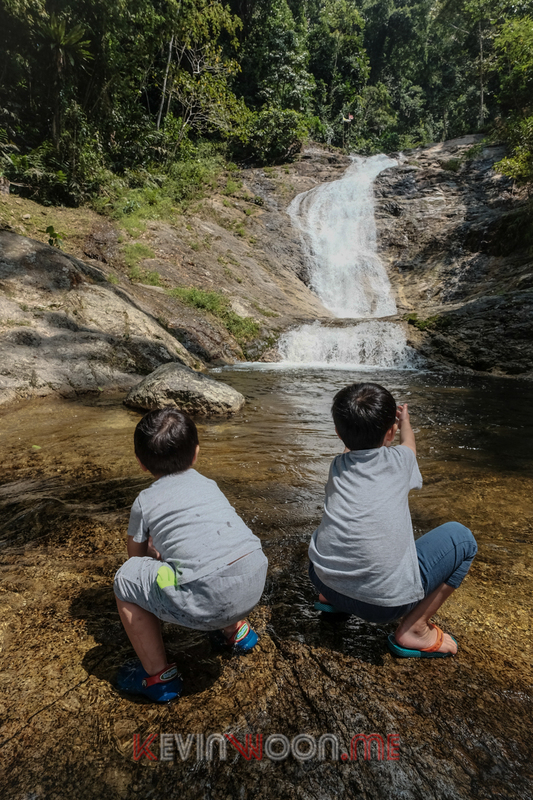 When I told the boys that we’re going to stop by to see a waterfall, they were so excited about it. 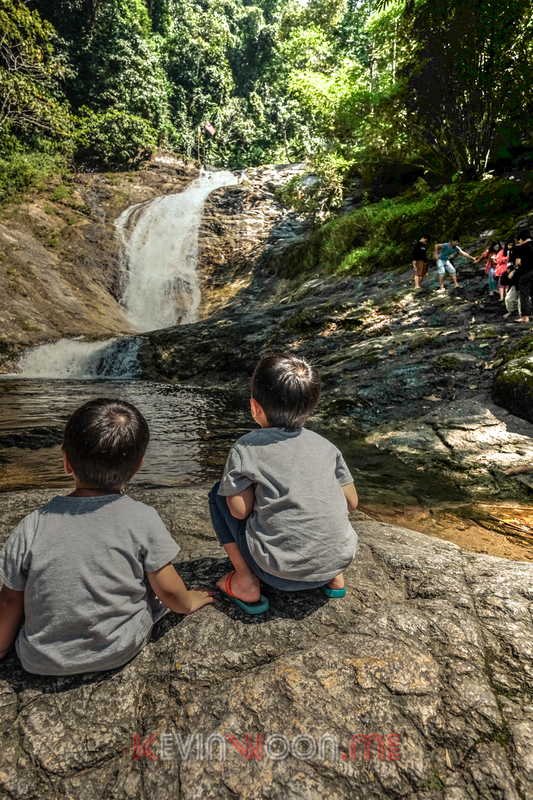 Lata Iskandar waterfall is located along the trunk road from Tapah to Cameron Highlands, 25km before Ringlet. The waterfall cascades over several tiers of granite slopes. The waterfall is right beside the road so you will definitely not miss it. Like other visitors, I parked the car by the road side and walk towards the waterfall. 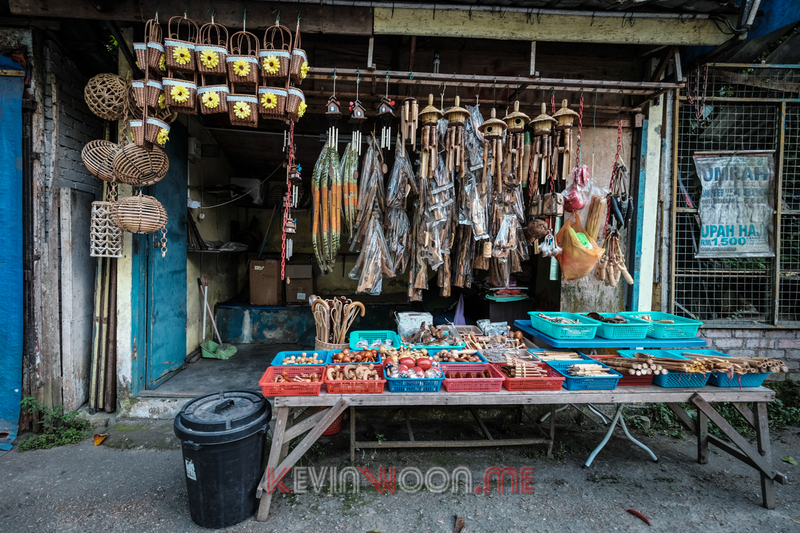 Along the road you will see many stalls selling food, drinks, souvenirs and antiques. 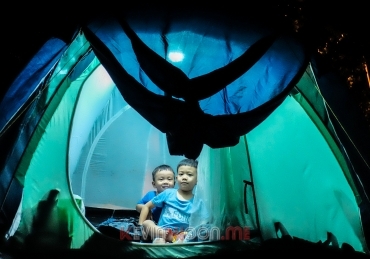 I believe majority of the stall owners are Orang Asli. Entry to the waterfall is free for everyone. 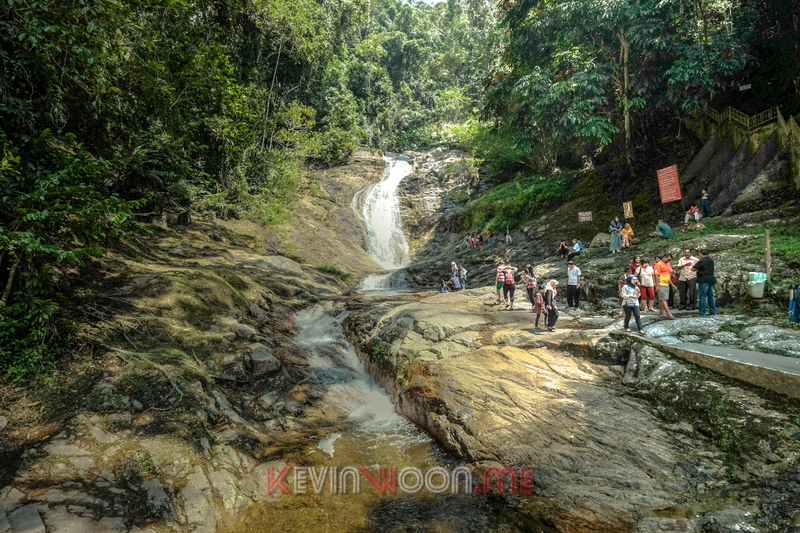 The lowest tier of the Lata Iskandar waterfall is full of tourists. I let the boys splash the water a little to let them feel the cool water. I would but I couldn’t let them take a dip in the water as we weren’t prepared for this and didn’t have the right “attire”. 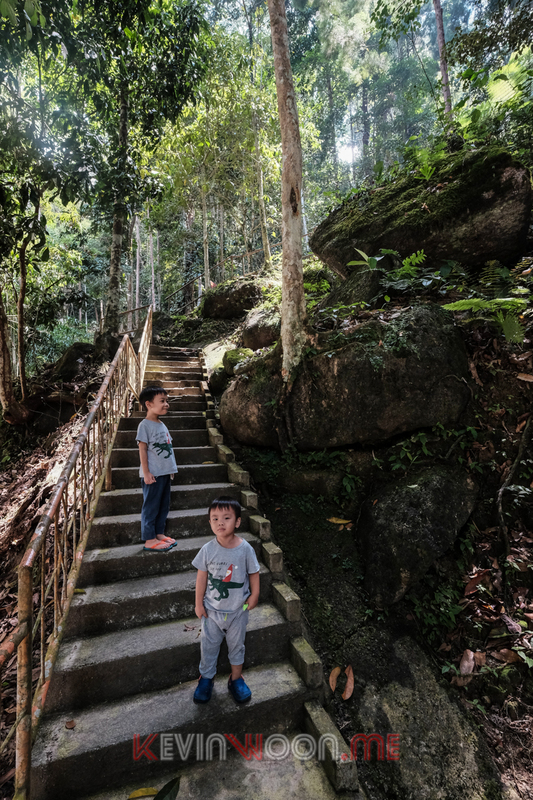 There is a flight of stairs where we climbed to reach the next tier of the waterfall. 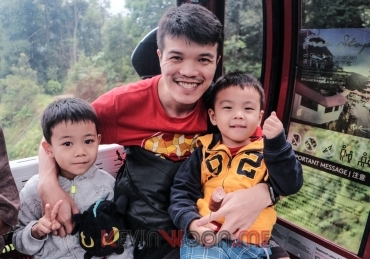 It was only us who were taking the walk up stairs so the boys, especially Yuyu could take their own sweet time doing so. Nothing much up top so we just took a few photos and made our way down again. 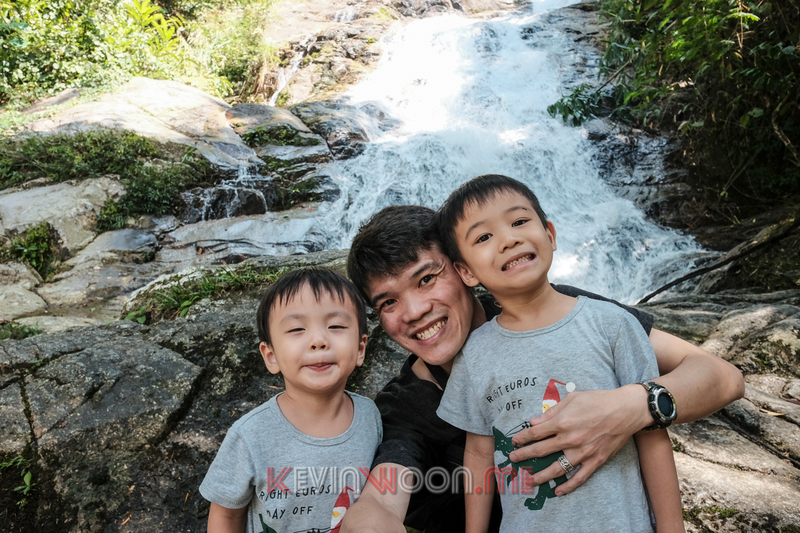 We spent around 1 hour at the Lata Iskandar waterfall which was enough to make the boys happy about it. Time to move on to our next destination. 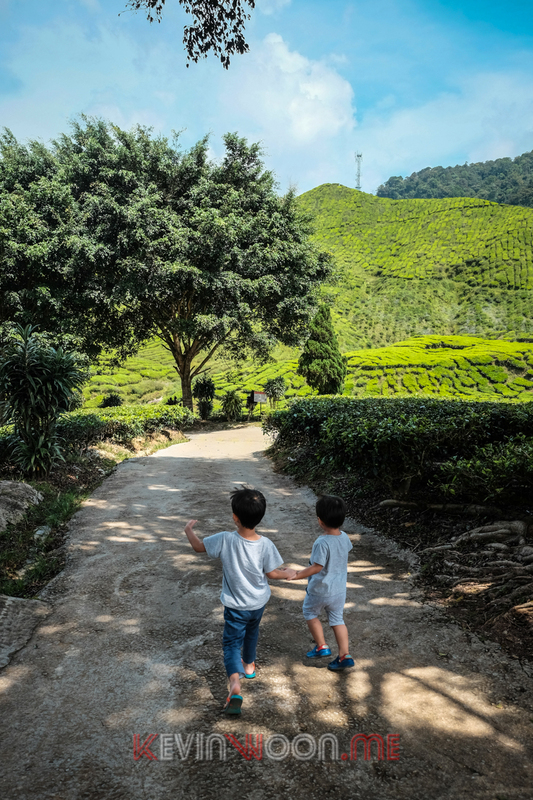 After around 30 minutes drive, we reached our next destination – Cameron Bharat Tea Estate. 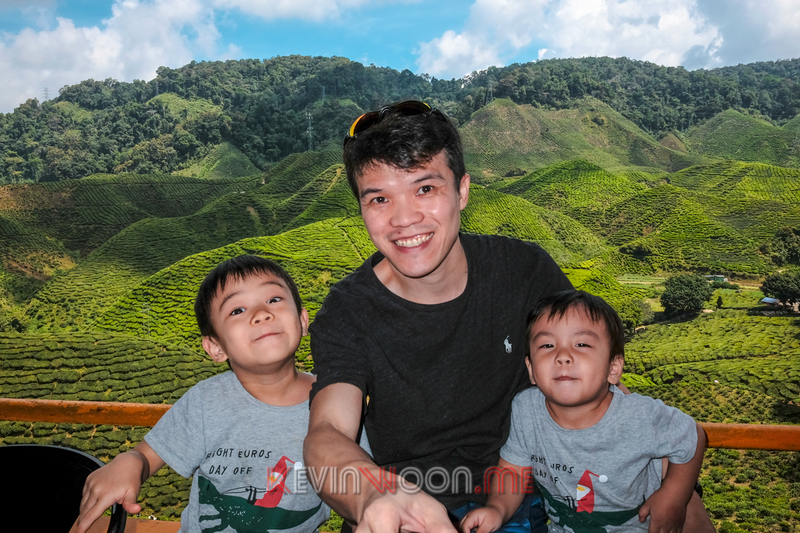 What would a trip to Cameron Highland be without visiting a tea plantation right? 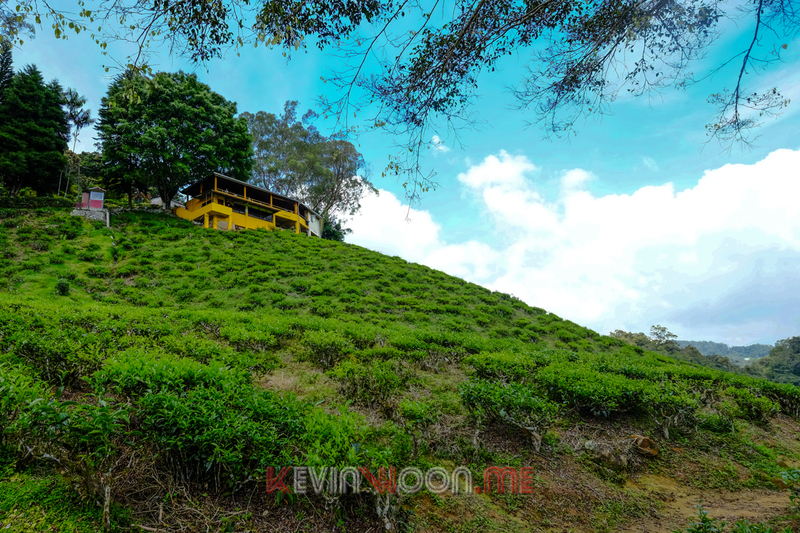 Cameron Bharat Tea Estate is located at the main road going up to Tanah Rata, 5km after Ringlet. 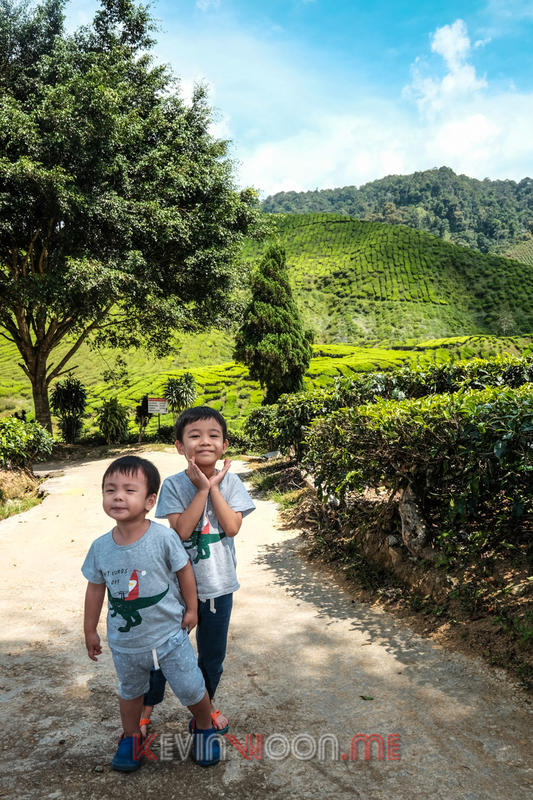 It is the second largest tea producer in Malaysia, producing Cameron Valley Tea. 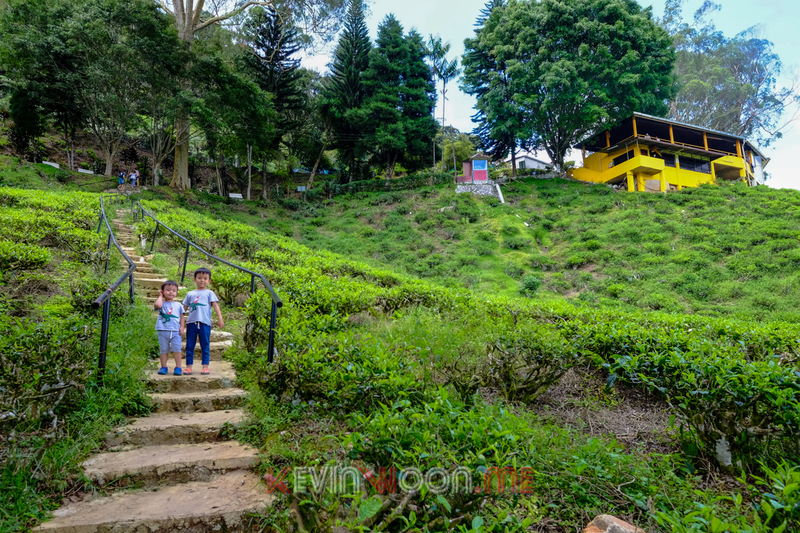 There is a platform overseeing the tea plantation, where visitors could enjoy an afternoon tea with a great view. It’s already 1.30pm so I ordered some pantries and drink to fill up our empty stomach. 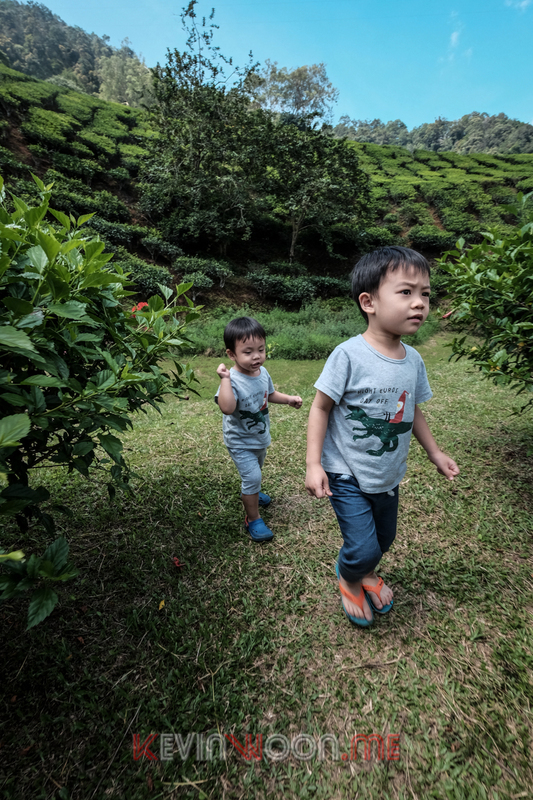 After the food, we walked down to the tea plantation. 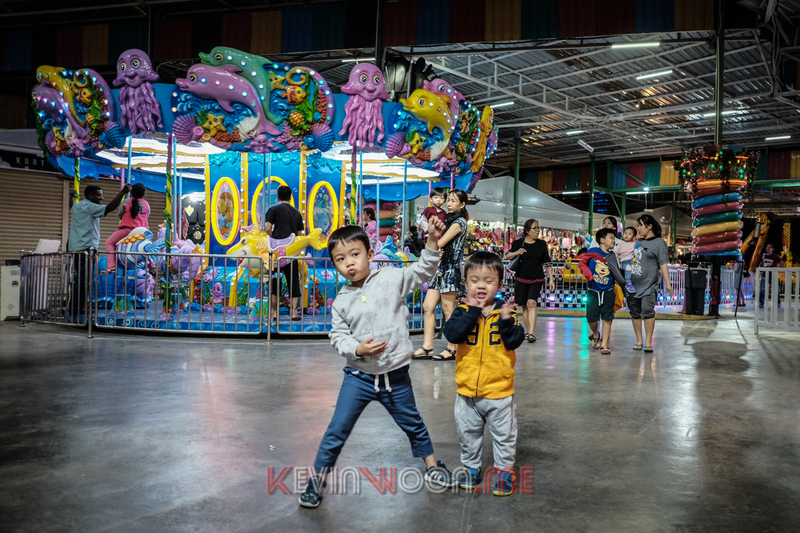 Adults is charged RM2 per person while child is free to enter. You can also choose to ride a buggy down instead of walking. 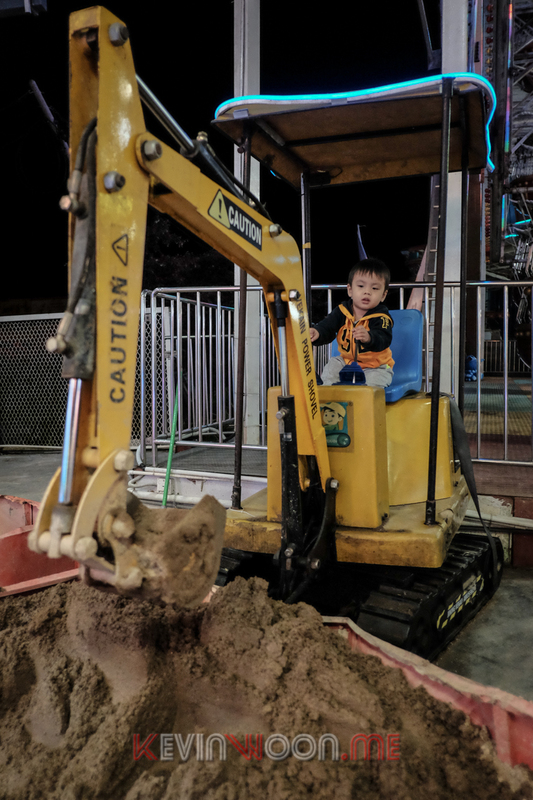 The fee for buggy is RM10 per adult, RM5 per child (4-12 year old) and free for child below 4 year old. 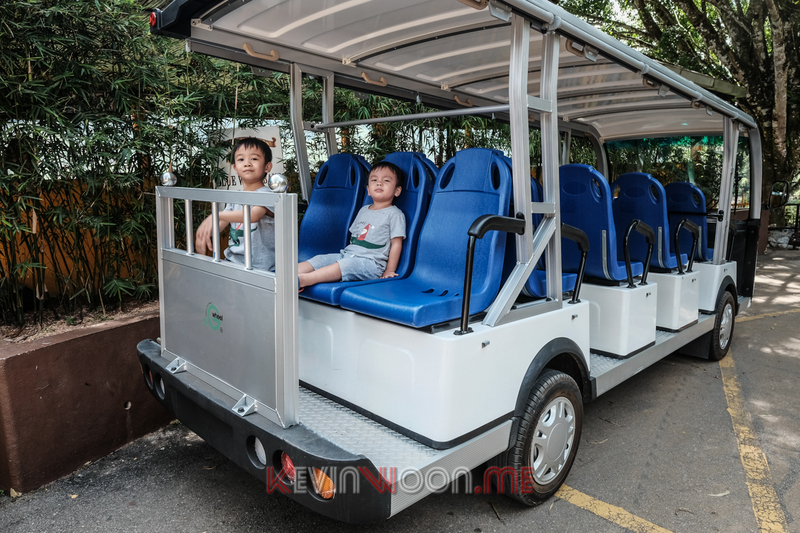 Unfortunately, the buggy driver was on lunch break during that time and the boys were disappointed that they couldn’t ride the buggy. 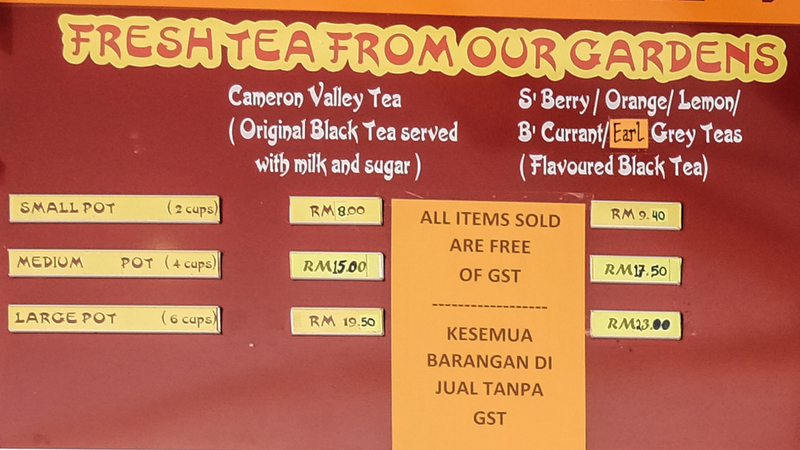 Including the eating session, we’ve spent about an hour here at the Cameron Bharat Tea Estate. Time to head straight to Brinchang to check in to our hotel. 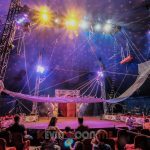 I’ve booked a boutique hotel in Brinchang through Agoda – Snooze Too Hotel. The person in charge was nice enough to offer us a bigger room so the boys could have more space to walk around. The room had a king size bed to fit the 3 of us. The room was spacious and clean. We had a quick shower and off we go. 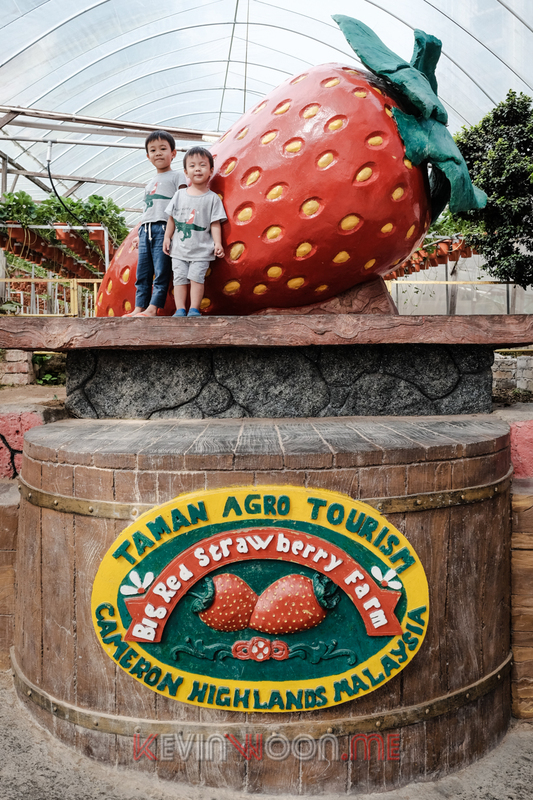 The Big Read Strawberry Farm is just 15min walk or 5min drive from our hotel. We chose to drive there for convenience. 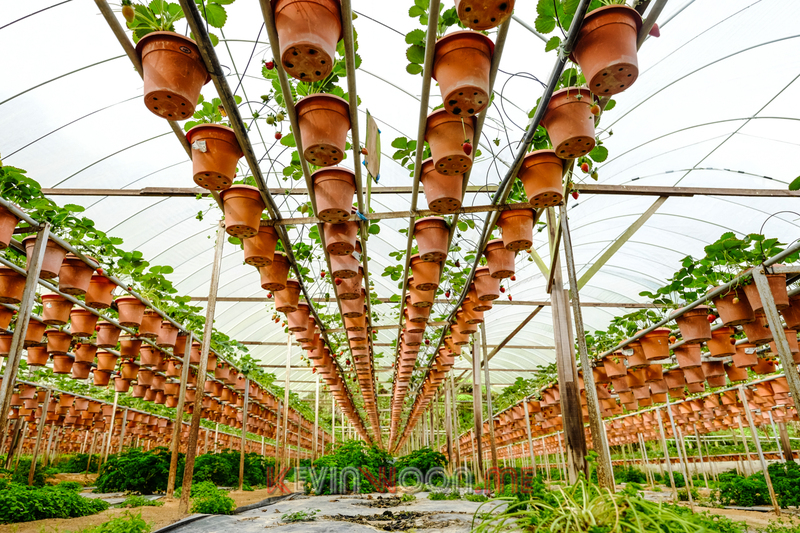 It was free to enter the strawberry farm. 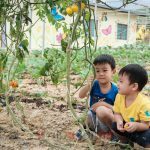 The boys to to see different vegetables planted using hydroponics method and of course the strawberries. 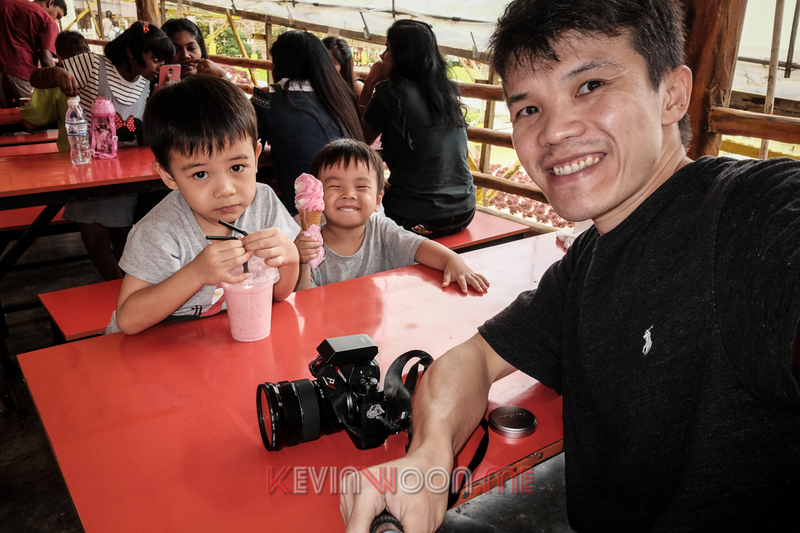 But I guess the boys enjoyed the strawberry ice cream and milk shake more than anything else in the farm. 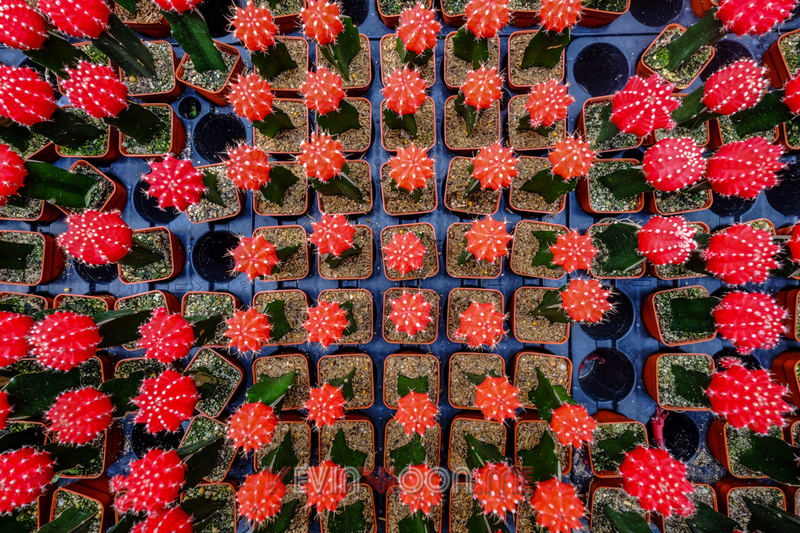 Cactus Valley is located just beside the Big Red Strawberry Farm. 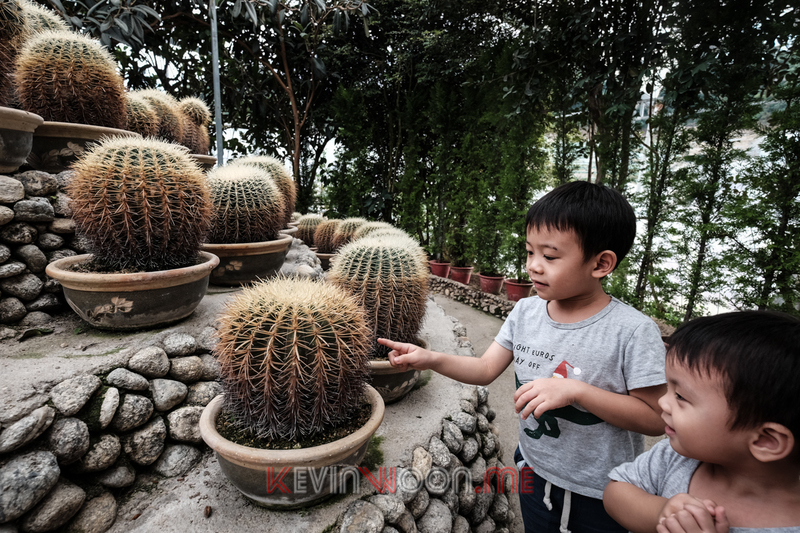 When I told Ping that it’s all about cactus inside, he was skeptic at first to go in because he said he was scared. 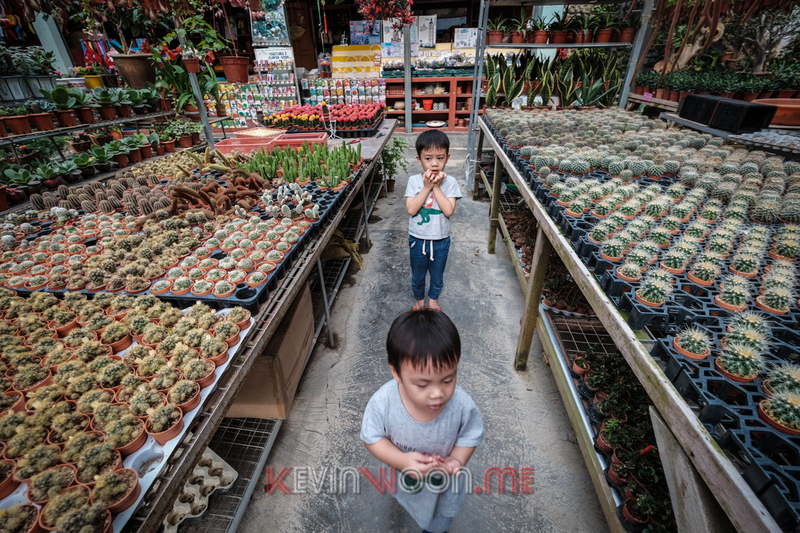 But after some “sweet talking” to him and show him cactus of different shapes and colors, he was ok again to move around and even touched the cactus. 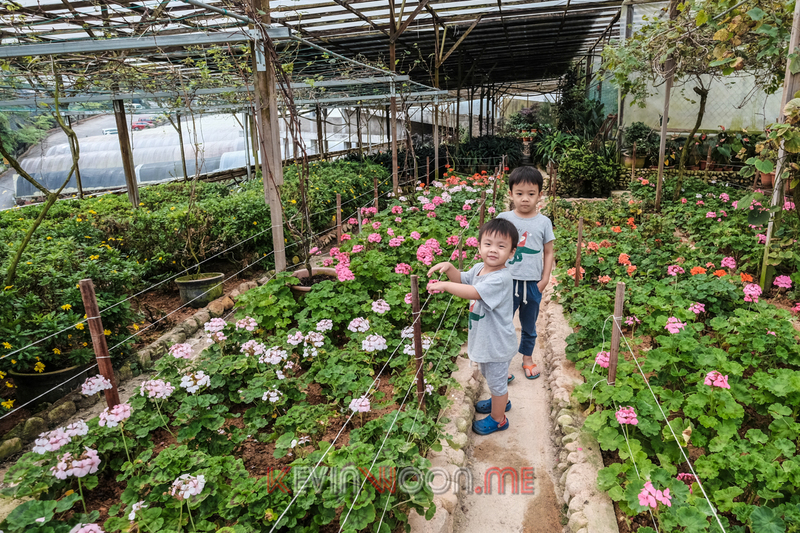 Besides cactus, the boys were also able to see different flowers here although most are similar to what we have seen earlier at the Big Red Strawberry Farm. 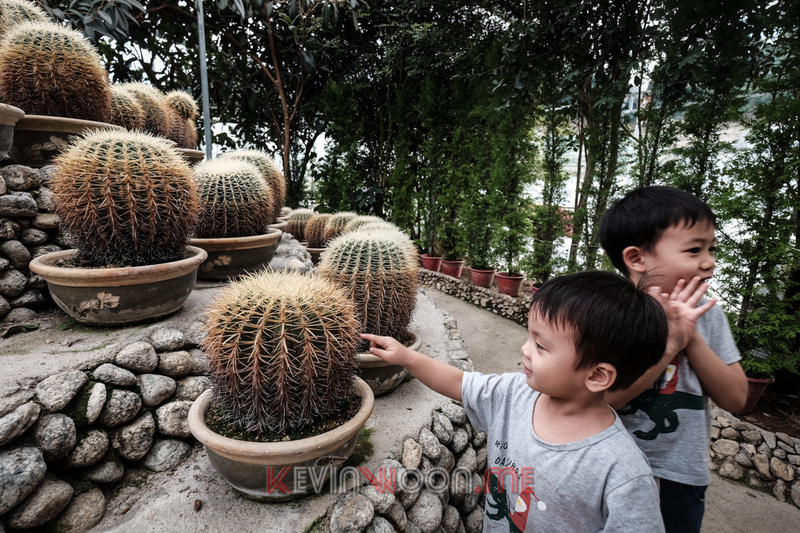 However, unlike the Big Red Strawberry Farm, we had to pay to get in to the cactus valley – RM5/adult and RM3/child. 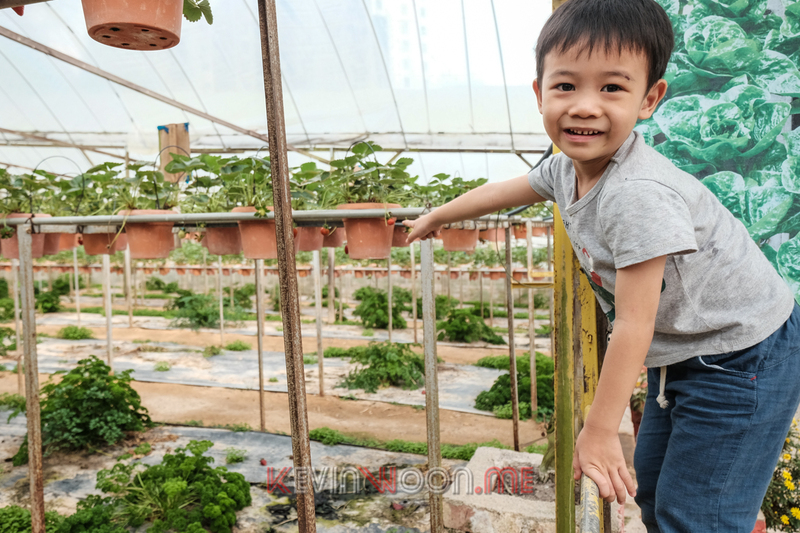 In total we have spent only around 1 hour at the Big Red Strawberry Farm and Cactus Valley. 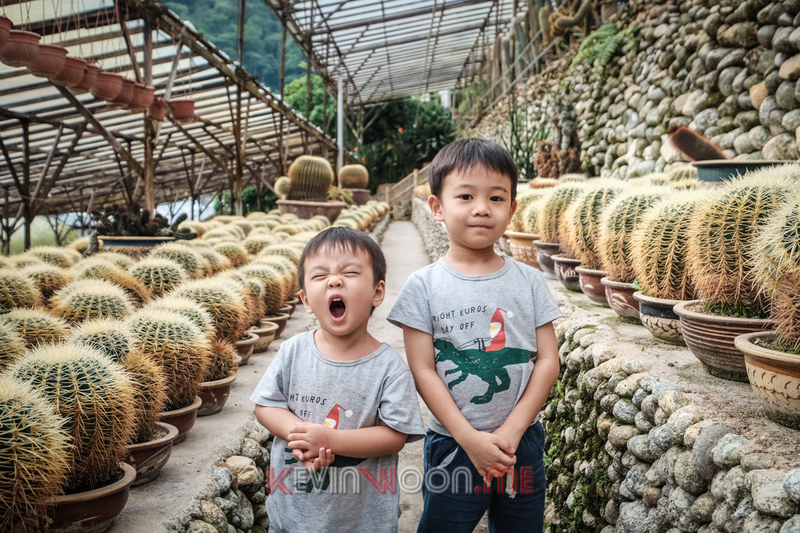 I think we could have stayed longer but the boys were already way past their noon nap and were showing sign of fatigue. So I had decided to bring them back to the hotel for a short nap before the grand finale of the day – Holiday Park, a mini amusement park. 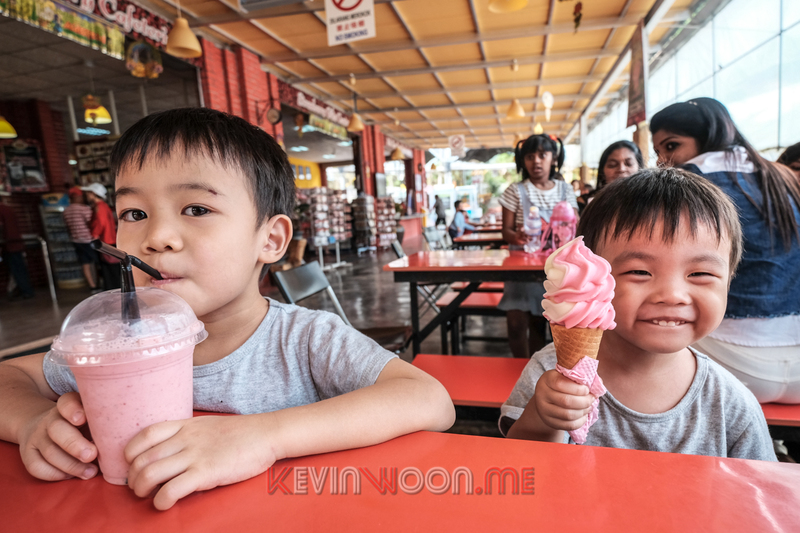 I could have let them picked strawberries but before the trip I had surveyed the price online and the price doesn’t justify the “fun” of doing so. 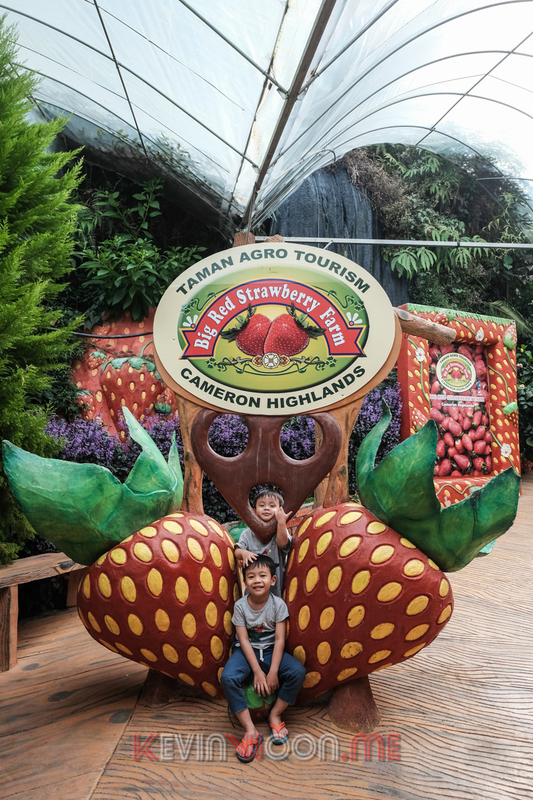 I think on average, the price for picking strawberry at Cameron Highland is RM25-30 per half kg. Besides, we couldn’t finish so much strawberries on our own and the hotel that we stayed at didn’t have a refrigerator. 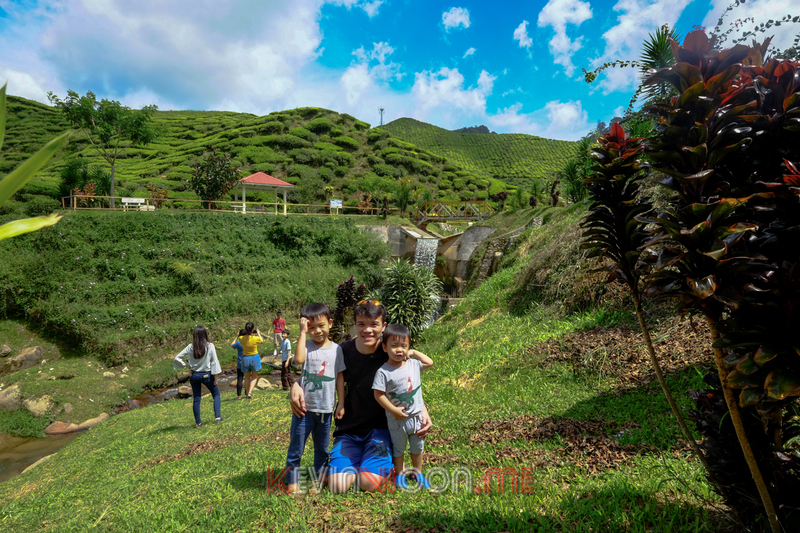 After almost 2 hours of nap for the boys, we are ready to head to the Holiday Park, which is a small amusement park located next to the Nova Highlands Resort and Residence, Aranda Nova. But before that we need grab some food for dinner. This is the part that I screwed up – I thought we could have steamboat at Aranda Nova but I didn’t know the steamboat shop had closed down. There was another steamboat restaurant beside Aranda Nova but it was packed and we had to wait for seats. 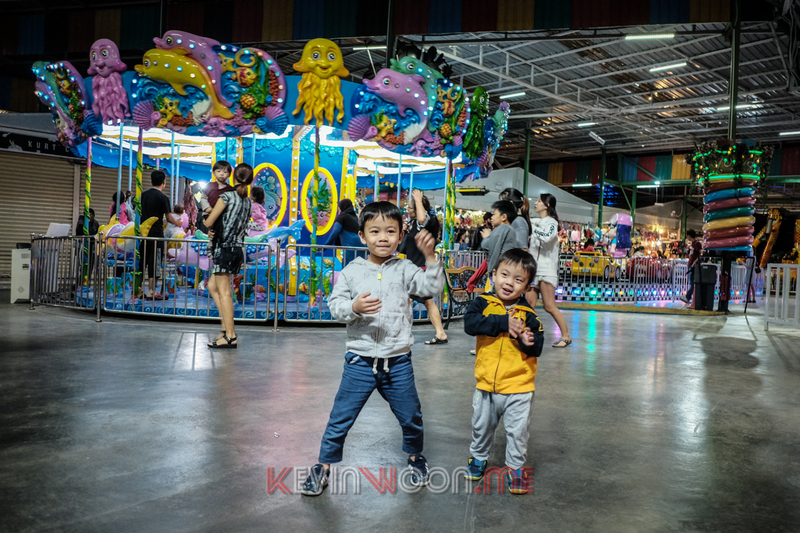 It was already around 8pm and I didn’t want to drive 15min back to Brinchang for dinner because I wanted to let the boys have more time at Holiday Park. We ended up having dinner at Old Town White Coffee inside of Aranda Nova. We picked a table to sit at where we could see Holiday Park right across the road. 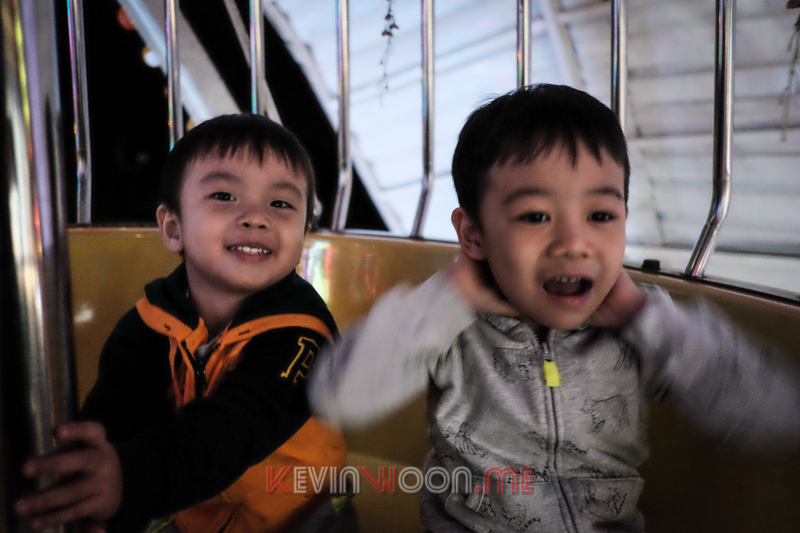 After the food, the boys were eager to walk over to Holiday Park as they have been waiting the whole day for this. 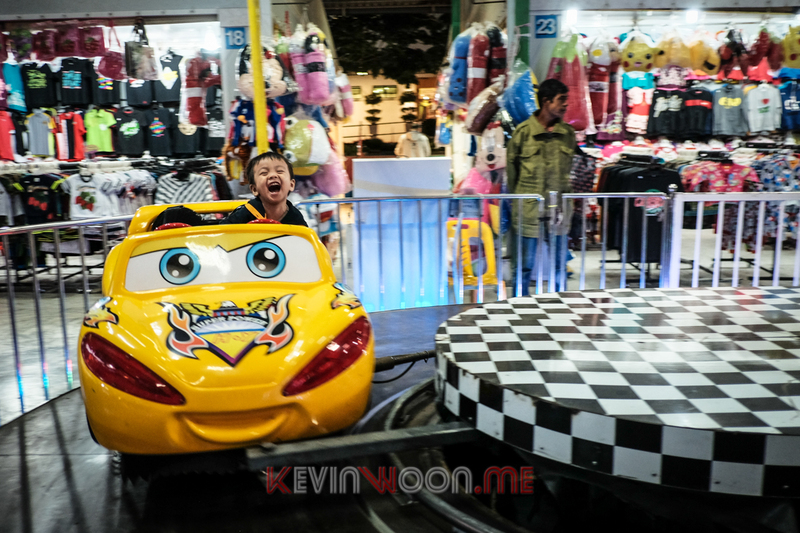 One reminder though, the games and rides are expensive – on average it’s RM5 per person per game. 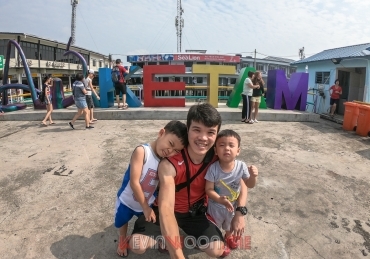 Ferries wheel was RM5/person. Too bad there wasn’t any view around to look at. Train ride – RM5/person and it was totally not worth it. The train just went out of Holiday Park, drove to the front of Aranda Nova and back to Holiday Park. It only lasted for 5min. The boys were disappointed because they were very excited at first when they saw the train during dinner. 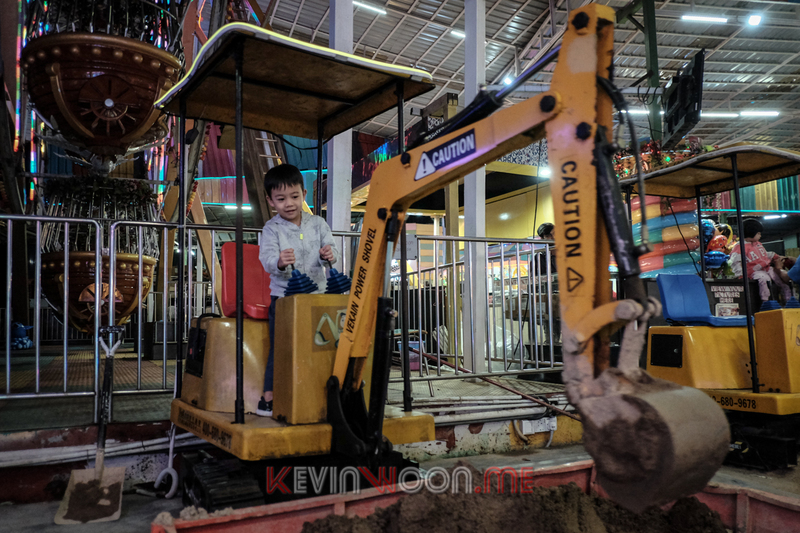 Excavator – RM5/person for 5min. 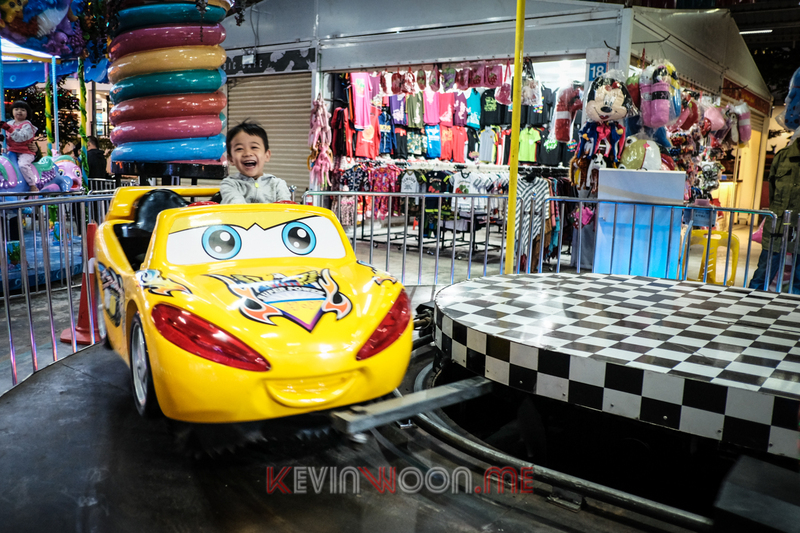 The “crazy” car ride was perhaps the boys’ favourite game because the could feel the adrenaline rush when their cars speed up when making the turn. Just look at the joy on their face. RM5/person and it lasted for about 5min. 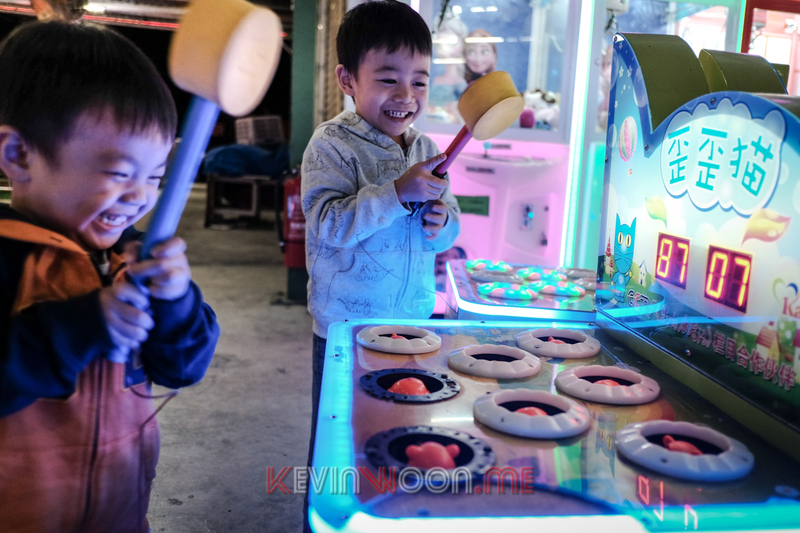 Hammering the cat game – RM5/game. 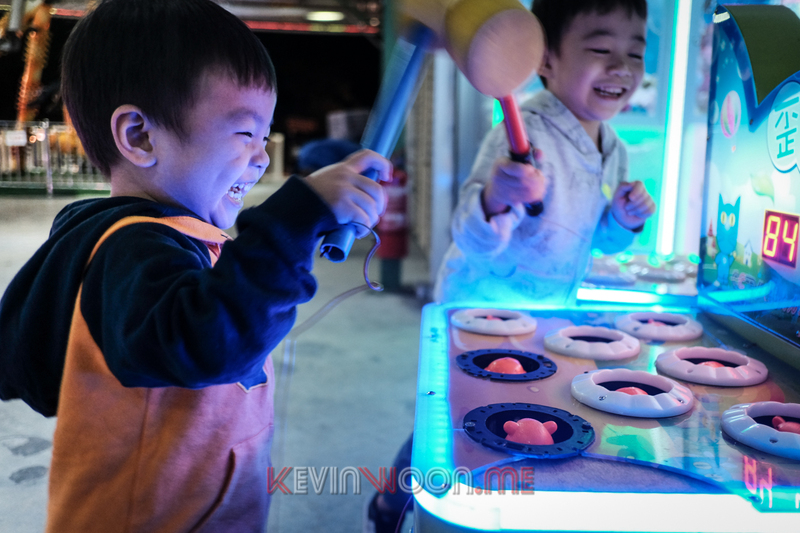 The boys had much fun playing this as well. 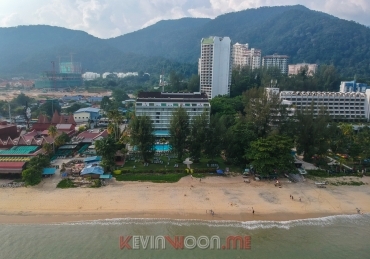 Final photos of the boys at Holiday Park before we called it a day and went back to the hotel.